An online friendship that started with shared grief. My friend Laura blogged for 772 consecutive days — from the time her son Benji was diagnosed with Leukemia at the age of seven to the day he died, six weeks after his ninth birthday. I found Laura through her blog, Benjamin the Brave. The first post I read was on February 6, 2017. The post was titled Day 767/139. Later, Laura explained to me that she titled each daily post with the number of days since Benji’s original diagnosis followed by the number of days since his relapse. A photo of Laura giving Benji a bath capped her update. She kneeled over him, her body completely covering his — shielding him from the camera — but I could see a glimpse of his bald head and his swollen feet. Laura had been trying to alleviate Benji’s intractable pain, giving him some comfort during a time of complete desolation. A few days earlier, they’d gotten the news that Benji’s cancer had outrun his treatment. Laura knew he was dying. I read her words with a lump in my throat and dawning recognition in my heart. We were two mothers who had never met, going through impossible heartache. On that day in February, my 15-year-old daughter, Ana, was dying too. I had been desperately searching for guidance to help her through the process. I’m not sure how I found Laura’s blog, but her writing pulled me in. It was luminous, loving and surprisingly hopeful, even in the midst of her sorrow. Up until that moment, I felt as though I was alone in the dark. Laura became my light. I wanted to reach out to Laura and let her know I was out there with her, but I didn’t want to add to her burden. I’d been blogging about Ana too, and I recognized that Laura’s blog was as much a way for her to process her heavy reality as it was to update her inner circle about Benji’s health. It wasn’t an invitation for strangers to reach out. Even so, I sent her a tentative message on Facebook. Me: You don’t need to respond to this text, but I want to say that I’m going through this process with my daughter, Ana, though she’s home on hospice and your updates are really helpful. She’s got days where she’s functioning well enough to go to school (like today) and other days where she sleeps all day. I feel I’m walking this path with you and your words are giving me strength as I try to help my daughter through this. Laura (to her monumental credit) responded immediately: Wow. I can’t imagine Benji going to school right now — but what a gift that must be!! Thank you for reaching out. Have you had conversations with her about death? That’s how our friendship began. We exchanged a few more texts about keeping the kids comfortable, treatment for fevers and pain, and the pros and cons of dying at home versus the hospital. Then, five days after my initial text to Laura, on February 11, 2017, Benji died. Two weeks passed before I texted Laura again. She had continued to update Benji’s blog and I read each post, desperate to understand how she was processing his loss. On February 26th, I texted Laura. Me: I’m steps behind you. I wanted you to know your writing is helping a lot, though I can’t always read it because we are in the midst of this with Ana, with helping her through this. Laura: Oh mama. all my love. Nearly a month would pass until we spoke again. The next text was from Laura to me. It was March 23, 2017, the day after Ana died. Laura: Oh, friend. I am so very sorry. I’m here for you, for anything. As I reread these first interactions, I marvel at what we said to each other, at the (seemingly) casual way we discussed our dying children the same way I’d once reached out to other parents when I was a young mother concerned with breast feeding and potty training. I wish I’d known Laura back then. 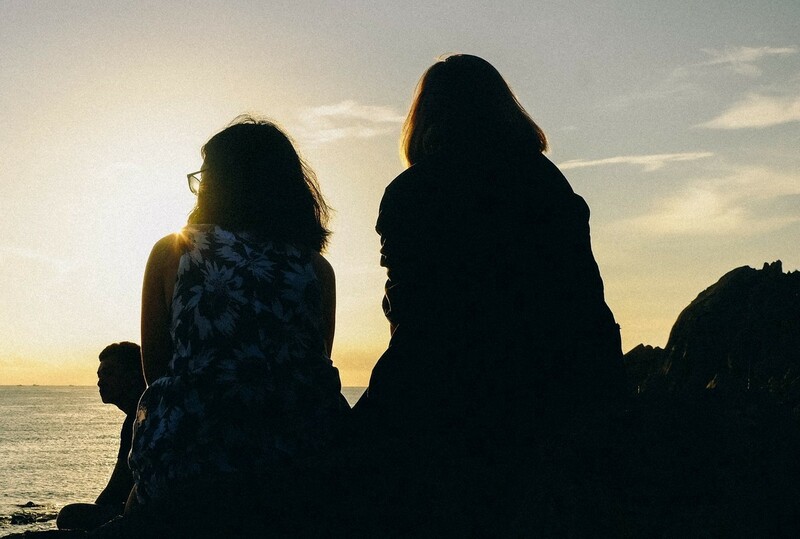 In the early days of our friendship, we were hobbled mothers, numb with grief, limping along in a landscape that was completely new to both of us. I can picture it in my mind as though it were a real place. It was something akin to the surface of the moon — dusty, pathless, desolate, and terrifying. But I could hear Laura’s footsteps just a few feet ahead of me, and she could hear me behind her. We were guiding each other through the darkness. A few days after Ana died, Laura reached out to me again. Laura: I’m here. a few steps ahead of you on the path. hoping to shine light on your footsteps, if I can. Me: I remembered something you wrote today and it helped — about how you were sad that Benji would never feel the sun on his face again, but then you remembered he was the sunshine now. We never stopped talking after that. We’re connected in so many ways — through the shared experience with our children, of course — but in other ways as well. We’re both writers. We both feel most connected to our children when we’re outside in nature and, particularly, through birds. We both have one remaining child, the exact same age (14, as I write this). Laura has a special relationship with owls. She has been following a nesting pair near her home since I’ve known her. For me, it’s hummingbirds. A friend gifted me with a hummingbird feeder the summer after Ana died and it gave me tremendous solace to sit in my yard and watch them, sometimes for hours. Laura and I take comfort in words — in writing them and reading them — we use words to process and share the experience of childhood cancer and parental grief. Laura lives in Florida and I’m in New York. We haven’t met in real life yet. We’ve never spoken on the phone. Our entire friendship — every conversation we’ve ever had — is contained within a two-year string of Facebook messages. My goal — my hope — is that we will meet in person some day and she will show me her owls. We are sisters in motherhood, in grief, in pain, and in friendship. These days, we walk side by side, shining a light for each other as we learn to navigate the landscape of loss together.